Posted on October 25, 2009 by Deli Lanoux, Ed.D. I was so captivated by the Franciscan Crown, as described by Miles and Gianopoulos in Saint Anthony of Padua (1991), that I began praying it using my five-decade rosary. Of course, no matter where I started decades six and seven I usually lost my place. So I designed my own! Because the Franciscan Crown is a celebration of events in the Blessed Mother’s life with Jesus, I envisioned a rosary with Mary in mind. 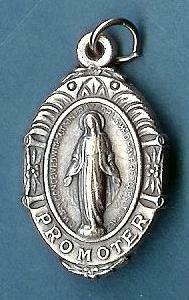 For this reason, my Franciscan Crown uses Catherine Labouré’s miraculous medal of Mary (MMM) rather than the traditional crucifix. 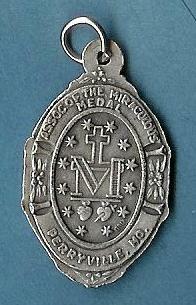 Surprisingly, it wasn’t until a friend asked about the medal on the Crown that I remembered the countless mailings I’d received from both the Association of the Miraculous Medal (AMM) and the Central Association of the Miraculous Medal (CAMM) over the years. 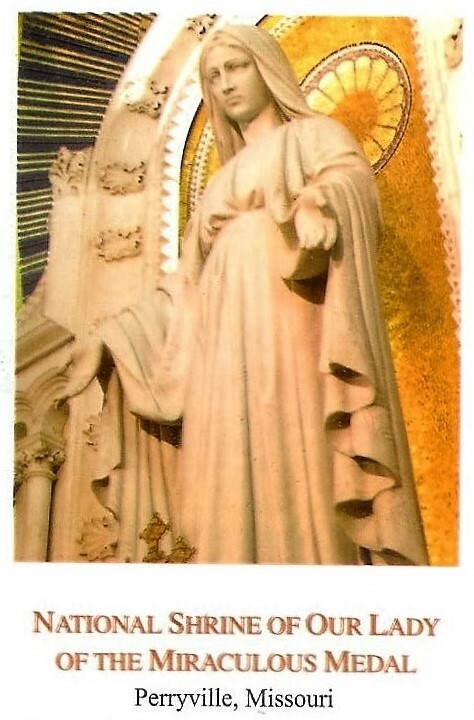 When I looked online to learn more and read the story behind the miraculous medal, I found not only CAMM’s print version of the prayers, but also the virtual novena to pray aloud with Brother Towey. The website was such a treasure trove that I included the link on our church website. Until I discovered the link was broken. Still, I wasn’t concerned. I’d enjoyed CAMM’s audio novena so much in the past that I’d saved its accompanying written prayers to a desktop file (2008; below). But why not spread the word so that others can share in the Blessed Mother’s love? During my convalescence from a triply-broken kneecap, I experienced the healing power of the miraculous medal of Mary and the Franciscan Crown, which prompted me to bead Crowns for friends and interested others. 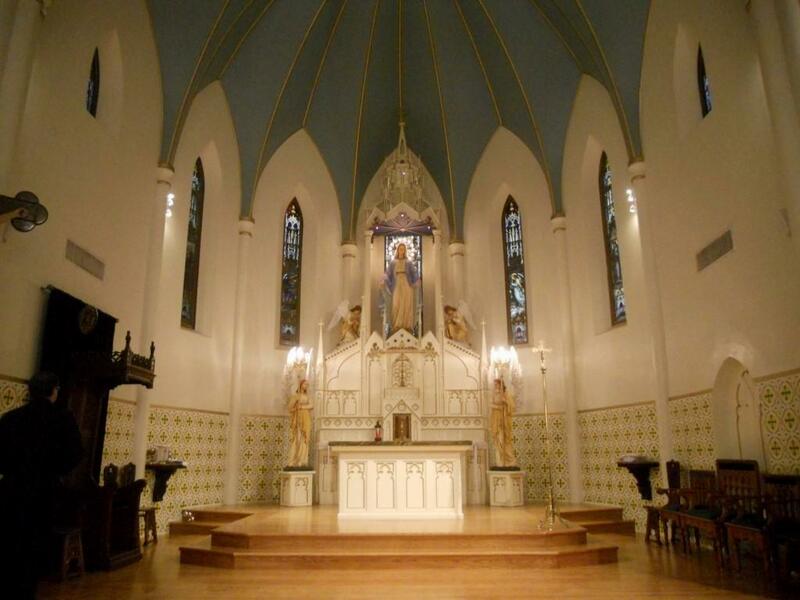 In no time at all, friends keeping company with the Blessed Mother shared their miracles. Three didn’t have cancer as numerous tests had suggested. One in dire need of a kidney suddenly experienced improved health for an extended period of time before finally undergoing a successful organ transplant. Another received the unexpected blessing of a second son after the tragic death of a firstborn son, and still another regained the sense of feeling she’d lost since her surgery. After seven whopper miracles, I stopped documenting. I decided to just walk in faith, give thanks and praise along the way, and rejoice with each shared story. Imagine. To experience the Blessed Mother’s intercessory power, I only had to pray the Franciscan Crown. Alone. Without meeting others in one locale, without reciting prayers at a specific time. And I never asked for anything. 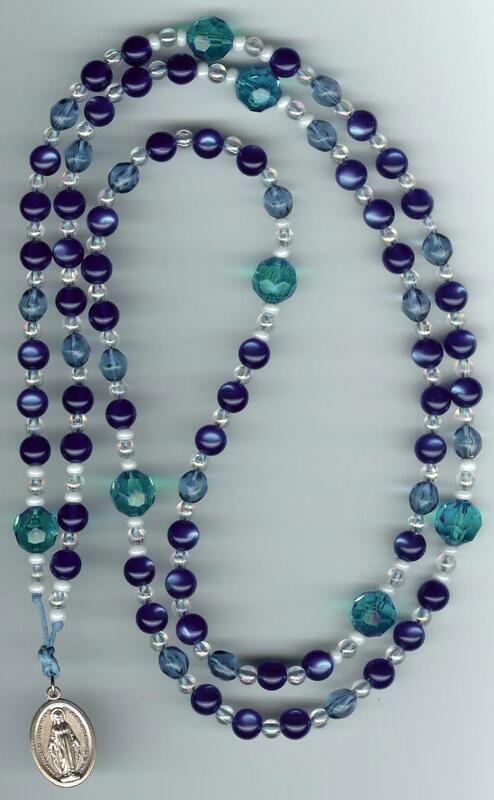 I simply conversed with Our Lady through my prayer beads… and envisioned her walking beside me on the beach. By focusing on Mary’s seven joys with Jesus, I sensed God so strongly that I didn’t have a care in the world. I forgot myself, and things worked out just fine. So, yes. I’m definitely a believer! 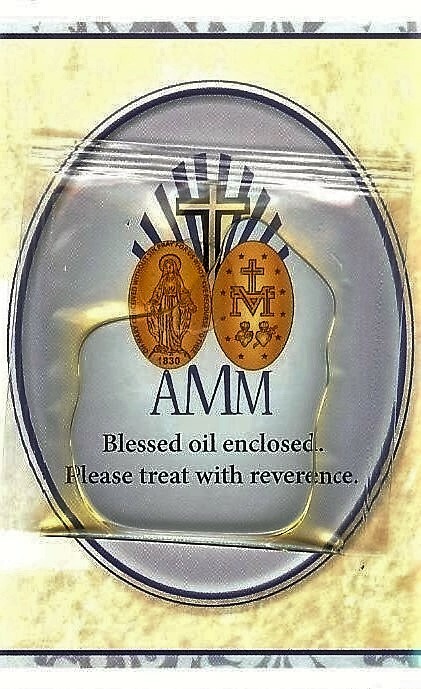 Miracles big and small are possible, so why not embark on a special journey with the Blessed Mother through the MMM novena and the Franciscan Crown? After all, she’s “compassionate… to all… devoted children who… call… with confidence” (Our Lady to San Juan Diego Cuauhtlatoatzin; the Word among us, Advent 2011, p. M36). Hail, holy Queen, Mother of mercy, our life, our sweetness, and our hope. To thee do we cry, poor banished children of Eve. To thee do we send up our sighs, mourning and weeping in this valley of tears. Turn then, most gracious Advocate, thine eyes of mercy toward us; and, after this, our exile, show unto us the blessed fruit of thy womb, Jesus. O clement, O loving, O sweet Virgin Mary. Pray for us, O holy Mother of God, that we may be made worthy of the promises of Christ. 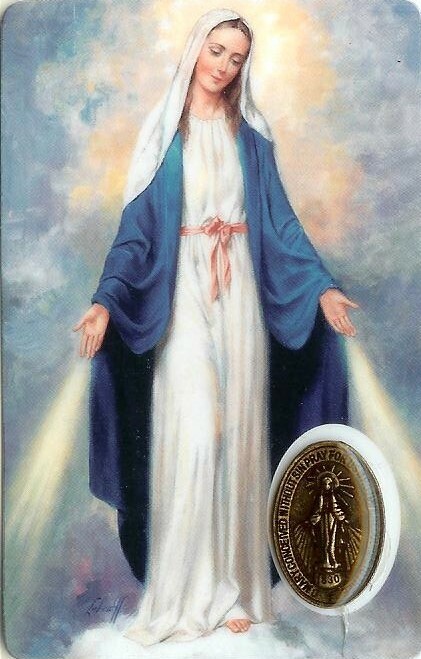 Our Lady of the Miraculous Medal… Virgin Mother of God, Mary Immaculate, we unite ourselves to you under your title of Our Lady of the Miraculous Medal. May this medal be for each one of us a sure sign of your motherly affection for us and a constant reminder of our filial duties toward you. While wearing it, may we be blessed by your loving protection and preserved in the grace of your son. Most powerful Virgin, Mother of our Savior, keep us close to you every moment of our lives so that, like you, we may live and act according to the teaching and example of your son. Obtain for us, your children, the grace of a happy death so that, in union with you, we may enjoy the happiness of heaven forever. Amen. St. Catherine Labouré, pray for us (AMM, 2010). You were so continually associated to the whole work of our redemption, associated with the cross of our savior [that] your heart was pierced at the side of his heart. And now, in the glory of your son, you unceasingly intercede for us, poor sinners. 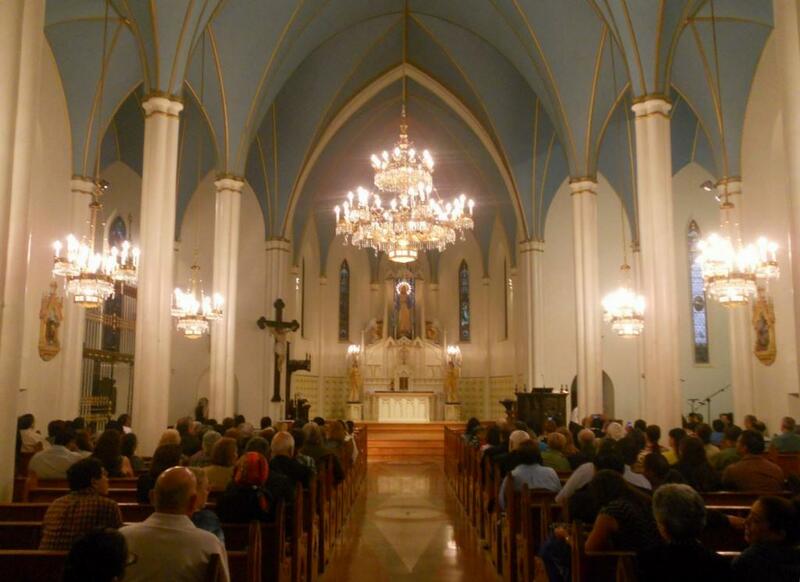 You watch over the Church whose mother you are. You watch over each of your children. You obtain from God, for us, all these graces symbolized by the rays of light coming from your open hands. If only we dare to ask them from you and come to you with the confidence and simplicity of a child. 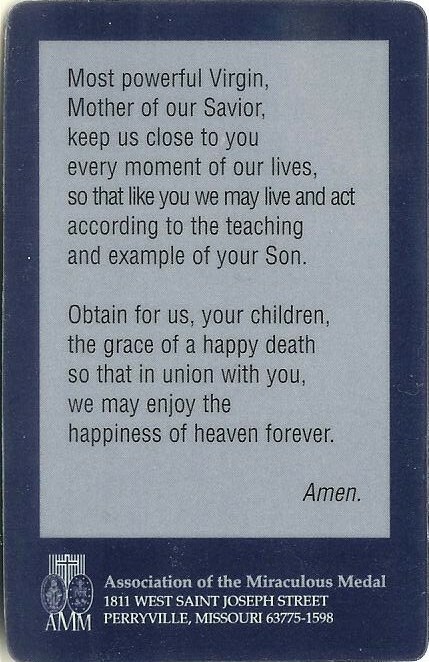 And so you guide us unceasingly toward your son, Jesus (AMM Bulletin 44:7; October 2011, p. 3). “Let us ask Our Lady’s help today in living our own dedication to the full, in whatever state God has placed us, in accordance with the specific vocation we have received from the Lord” (Father Francis Fernandez Carvajal). “In trial or difficulty I have recourse to Mother Mary, whose glance alone is enough to dissipate every fear” (St. Thérèse of Lisieux). I simply wish to note that the figure of Mary of Nazareth sheds light on womanhood as such by the very fact that God in the sublime event of the Incarnation of his Son entrusted himself to the ministry, the free and active ministry of a woman (St. Pope John Paul II). “Let us run to Mary and, as her little children, cast ourselves into her arms with a perfect confidence” (St. Francis de Sales). O sinner, be not discouraged but have recourse to Mary in all your necessities. Call her to your assistance, for such is the divine will that she should help in every kind of necessity (St. Basil the Great). “Immaculate Heart of Mary, cause of our joy, pray for us” (St. Francis of Assisi). If you wish to convert anyone to the fullness of the knowledge of Our Lord and of his mystical body, then teach him the rosary. One of two things will happen. Either he will stop saying the rosary— or he will get the gift of faith (Venerable Archbishop Fulton Sheen). The Christian heart has always known Mary as the essence of compassion and love to whom man can turn with particular and unreserved confidence. This is expressed so well by the intimate name that was given her from the beginning, the name of mother (Fr. Romano Guardini in The Rosary of Our Lady). For God so loved us that he gave us his Son through our Mother Mary. For sure, he is a loving one who intercedes for us; and through Mary’s miraculous medal, we get what we want and believe. Thank you so much, Blessed Mother. May you continue praying for us till the end of our lives. Amen. Thanks so much for your heartfelt prayer! (St. Thérèse of the Child Jesus). “A man is really clean of heart when he is searching for the things of heaven, never failing to keep God before his eyes” (St. Francis of Assisi). and generous (Pope John Paul II). God bless you most abundantly, Loise!